Eventually, a more informed citizen said that it was The Ship of Tolerance, which had opened the day before, May 11, as part of the 11th Havana Art Biennial to be held throughout the city until June 11. 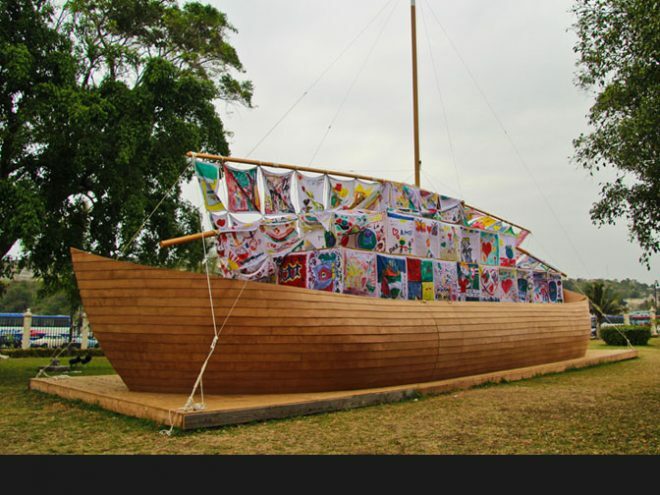 Surely, the well-known Russian-born, American-based artists Ilya and Emilia Kabakov would not be entirely upset about their project having been confused with the famous biblical boat, which carried from the most harmless beings of creation to the most dangerous predators in peaceful coexistence. Because those were their intentions when the sails of their boat—the ship was built by students of the City Historian’s Office Trade School with the guidance of experts from the Manchester College in the UK—were decked with 150 drawings made by children from ages 6 to 12 who study at Old Havana’s elementary schools. When on the afternoon of May 11, the sails were hoisted, an effort that had begun long before had come to fruition. Over 500 Cuban children had participated in workshops in which topics such as the meaning of the word tolerance; the consequences of war; the injustice of discrimination on account of race, religion or ideology; and the enriching experience of living in harmony with diversity in all its forms were discussed. Flowers, trees, suns, flags, outstretched hands and hugs were the symbols that were most used by the children to express the need of brotherhood among men. For these children, this experience will undoubtedly help foster their relationship with art and help them to become better persons.